Mr. Al Waynee is a Member of the Saginaw Chippewa Indian Tribe of Michigan. He started carving in 2008 when a friend in Florida asked him if he wanted a hobby - and he has been carving ever since! He enjoys transforming an ordinary piece of wood into something fun and different. Mr. Waynee continues to improve, learning new techniques and ways to paint his creations. His family and friends are the lucky recipients of his art. Mr. Waynee has experimented with other carving mediums, including stone, but wood is his medium of choice. This collection of sculptures is on short term loan from Mr. Waynee. It showcases his extraordinary woodcarving and painting skills, as well as the artistic expression he has developed and his obvious love for this hobby. 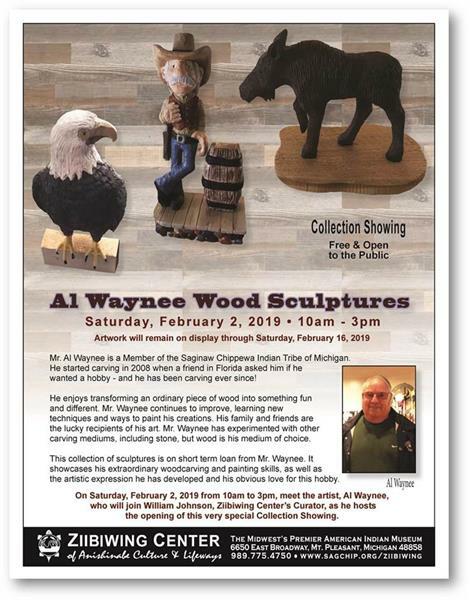 On Saturday, February 2, 2019 from 10am to 3pm, meet the artist, Al Waynee, who will join William Johnson, Ziibiwing Center’s Curator, as he hosts the opening of this very special Collection Showing.